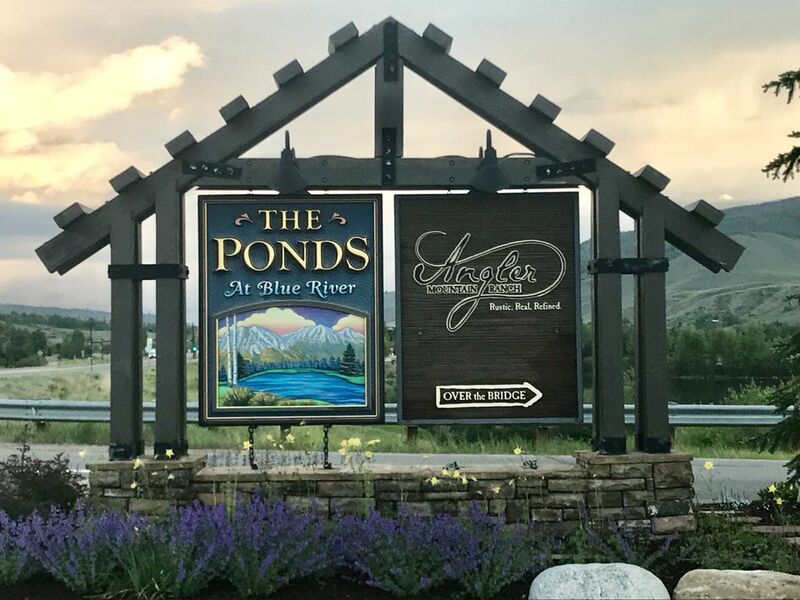 Take full advantage of the year round activities offered in Summit County by staying at The Ponds at Blue River. Located two miles North of I-70 exit 205 on Highway 9. This home is a short drive to Keystone, Copper Mountain, and Breckenridge. For the more adventurous, Vail is 35 miles to the west on I-70 and Steamboat Springs is 90 miles to the north on Highway 9. The townhouse has two bedrooms with queen beds and a third bedroom with twin beds. All bathrooms have in suite private baths. Master Suite with queen size Tempurpedic Mattress set and granite countertops in the master bath. Fall asleep to the sounds of the Blue River rushing past. Take in the great views of sunrise over the Williams Fork Mountains from the back patio or sunset over the Gore Mountain Range from the front adirondack rocking chair set. Enjoy cooking in the newly upgraded kitchen with all stainless steel appliances. Enjoy the view and relax in the professionally serviced and maintained private hot tub on the back patio a stones throw from the Blue River. A CharBroil gas grill is also provided on the back patio as well. An abundance of shopping and restaurants located in Silverthorne, Dillon, and Frisco should satisfy all your needs. Security Deposit: Deposit returned at 7 days after check-out upon inspection and cleaning. I'm a financial services professional with the intentions of retiring in the mountains to enjoy the outdoors and all the activities in Summit county. My wife and I decided to purchase in The Ponds at Blue River while we were on a skiing vacation back in 2002. The mountains, summer, fall, and winter outdoor activities, and what we think is a perfect central location all contributed to a long term decision made easy. I hope you find the same qualities in our second home that is never used enough but can be shared with guests. The complex is very quiet during the week and backs up to the Blue River and Williams Range to make for a great hot tub experience. The bike trail next to the river connects with the Summit County Trail Networks. The river can be heard with the master windows open. Great view of Buffalo Mountain from the front patio and Gore mountains from the back patio. Additional parking across from unit. No large motor homes permitted. Large, open, and fully equipped kitchen. Four bar stools. Newly installed all stainless steel appliances. Table has 6 chairs that fit with with extension in place. 37' flat screen TV/DVD in living room and all bedrooms. Adirondack rocking chairs on front patio. Rustic adirondack chairs/bench on the back patio. Excellent location for skiing 5 ski resorts. Beautifully decorated and very comfortable. We really enjoyed our stay. The condo was very nice (loved the decor). It was clean and comfortable and all rooms have their own bathrooms. Great views out the front and back. Enjoyed the hot tub especially in the morning as the sun was coming up over the mountain...so pretty. I had a question which I texted to Michael the host and he got back with me promptly. Most definitely would stay here again! Thank you so much! Great place! Good over all but owners never responded to phone call/voicemail. The house was great..wouldn’t recommend for busy kids since there are so many little decorations around. Owners didn’t reply to phone call/voicemail or a text message. Laundry was left in the washer when we arrived at 4 and we had to finish it. The directions for the garage were in correct so we wrote in the welcome book the correct instructions after we figured it out. Over all the stay was great except those minor things. Great little house in a nice area. Centrally located to the major ski resorts, but not high priced like the resorts. I would stay here again. Convenient and well appointed! Everything was perfect.